In an effort to highlight places of interest in countries across the world, their varied culture, economy and history, The Statesman brings to you a Weekly Focus on countries with which India shares diplomatic ties and friendship. This week’s focus is on Nepal. Know all about the country. Climate: The monsoon season begins around the end of June and lasts until the middle of September. About 80% of Nepal’s annual rainfall is during that period, so the remainder of the year is pretty dry. Spring and autumn are the most pleasant seasons, winter temperatures drop to freezing, with a high level of snowfall in the mountains, while summer can be blisteringly hot. The Kathmandu Valley, at an altitude of 1,310m has a mild climate, ranging from 19-27ºC in summer and 2-20ºC in winter. Nepal’s holidays and festivals concentrate on religious and cultural events in the Hindu and Buddhist calendars. Dashain in early September is the most important, surrounded by many other events, and the Tihar Hindu festival of lights is one of the loveliest. Other festivals include Shree Panchami, Ghode Jatra, Holi, Mata Turtha Puja, Buddha Jayanti, Gaijatra, Indra Jatra and Krishna Janmastami. Sandwiched between India and China, Nepal’s cuisine is heavily influenced by its neighbours – although dishes tend to be simpler and less varied. Meals are typically spicy and meaty, although that’s not to say you can’t find good vegetarian cuisine. Indeed, the national dish is dal bhat (lentil curry), which, like most dishes, is accompanied with rice and thin pancake-like bread known as chapatti. Some of the specialities are Tarkari, Thukpha, Rotis, Choyla, Cel roti, Pani puri , Momos. Some regional drinks are Chai, Butter tea (popular among Tibetan cultures; the combination of salt, butter, and hot water), Lassi , Raksi (wheat or rice alcohol). Kathmandu: The decaying buildings in the heart of the city are a contrast to the lively atmosphere that permeates the streets. The highlights include Durbar Square, the largest of the palace squares in the three royal cities and a UNESCO World Heritage Site, Pashupatinath Temple and Hanuman Dhoka. Temples and monuments of varying shapes, sizes, styles, and faiths can be found here. Set atop a forested hill, the ancient Buddhist complex of Swayambhunath is a can’t-miss attraction that offers sweeping views of the Kathmandu Valley. 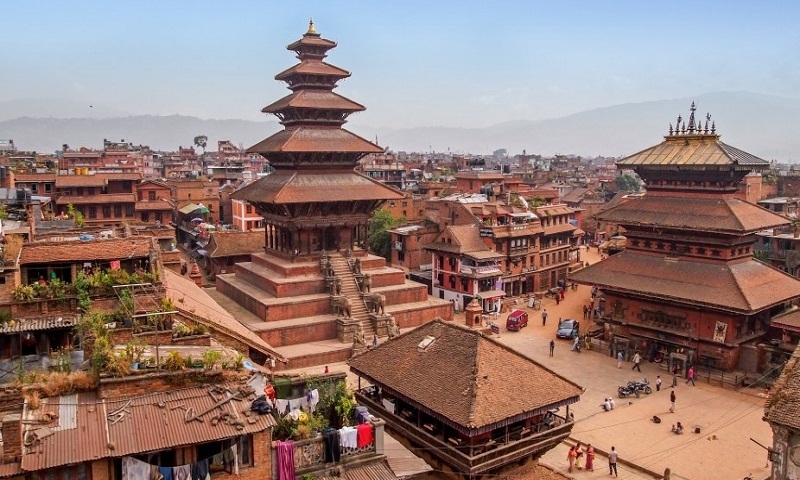 Bhaktapur: The third of the “Royal Cities,” it lies on the old trade route to Tibet, just outside Kathmandu. For Bhaktapur, the trade route was both an arterial link and major source of wealth. In contrast to Patan and Kathmandu, the population of Bhaktapur is primarily Hindu. The best place from which to begin a tour of the city is Durbar Square, where in addition to the royal palace, several temples are also situated. The whole area is a UNESCO World Heritage Site. Boudhanath Stupa: Just outside Kathmandu, it is one of the largest stupas of its kind in the world, and dates to sometime around the 6th century, possibly even earlier. The stupa itself is a symbol of enlightenment but at Boudhanath the symbolism is particularly clear. Other tourist attractions are Pokhara (gateway to Himalayas), Chitwan National Park, Patan(Newari architecture), Nagarkot (best known for the views it offers of the mountains and the Kathmandu Valley) and Lumbini (famous for being the birthplace of Siddhartha Gautama, the historic Buddha, known as Buddha Shakyamuni). Regions to trek are Mount Everest the Helambu region and Annapurna region.